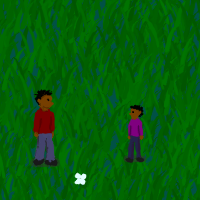 My latest game, “Passing the Ball,” has gone live on the GDC Online website. It’s a game about parenting, playing catch, and digital safety for kids. The good folks behind GDC Online, a professional conference for connected gaming, commissioned me to create a game for Web Wise Kids. Web Wise Kids is a really cool non-profit that provides curriculum materials and classroom video games for parents and teachers that focus on teaching kids to be their own first lines of defense against digital threats. They help prepare kids to avoid online bullying, viruses, and dangerous adults by teaching them how to safely surf the web and use other digital technologies. They use their own games to educate kids and encourage safe behavior without a lot of fear-mongering. You can donate to Web Wise Kids here. I tried to make this game communicate a concept about how to protect kids by using game mechanics. I’m usually a story-focused person, but game rules are a great way to make a statement about the way the world works. I hope that you’ll play the game until you win, get the message I was trying to convey, and maybe even donate to Web Wise Kids! Play “Passing the Ball” at GDC Online at Newgrounds.